Starting in 2001, Matei Câlția initiated, at the beginning through Galeria deINTERESE and afterwards, through Galeria Posibilă, a platform to support and produce works of MFA students who proved to have well researched projects. Over the years, the emphasis fell onto the collaboration between artist and gallerist in order to ensure a better understanding of the artistic experience. 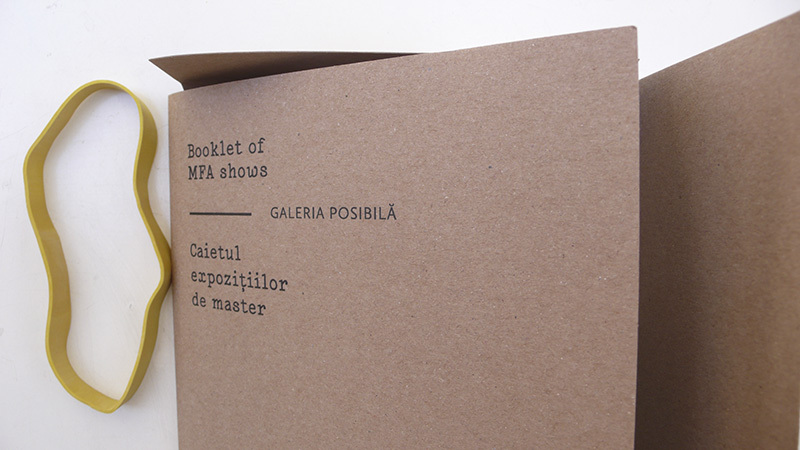 The Booklet of MFA shows is an endeavor in the publishing field, representing a first initiative to document a yearlong project. Through it, we can follow the way the artists relate now to their exhibited works and the impact such collaboration might have in an artist’s carrier. The booklet launch will be accompanied by an exhibition of a selection of works presented within the MFA project, therefore framing a retrospective which documents different themes and mediums approached since the very first exhibition until now. This project is co-financed by the Administration of National Cultural Fund.